The list of inks included in database is displayed. The four process colors C,M,Y and K are pre-installed. They are stored in the color book CMYK and are already marked by a screen color. By using the "Export" function you can hand over individually edited inks and color books easily to another printing machine. The resulting evaluations of the different statistical analyses can be printed out in so called reports. The gray balance display will show densitometric gray balance values for CMY in a bar graph. Densitometric values can be solid density, dot area, dot gain or trapping values. Colorimetric values are typically CIE L*a*b or ∆E-color information. In measuring conditions section, a list of data sets for target values and tolerances will be displayed. It is based on ISO 12467 color values for CMYK. Individual target and tolerance settings can be made as well - also for spot colors. Using the buttons "to top side" and "to reverse side" you can switch between the measurement of the color bar length for top- and reverse-printing. This requires that a press with a reversing unit has been defined. Techkon SpectroJet is the ideal extension to Techkon's renown hand held instruments. 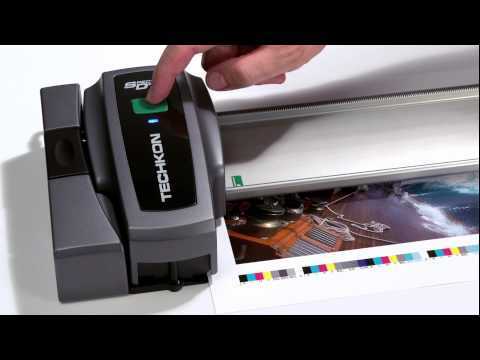 Techkon SpectroJet Basic supports up to 6 printing units. Techkon SpectroJet Pro supports up to 16 printing units. Measurements in colorimetry modes have the advantage of an absolute description of color based on characteristic values. InkCheck function gives spectrally based recommendations on how to set the ink key as used from density in order to meet colorimetric targets required for printing within ISO standards. Display evaluation according to ISO 12647, GRAcol G7™ generator.